Fishing is supposed to be relaxing, dammit. Sure, sitting on a boat in the sun drinking beer with your buddies is relaxing, but what about the whole casting motion? You call that relaxing?! I need to actually move my arm and exert some energy, which I am not a fan of. 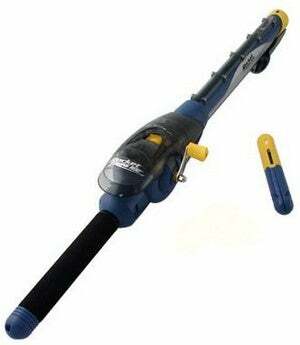 What I need is this Rocket Fishing Rod, which launches the hook, line, and float via a handheld compression unit. Now all I need is a way to get that Bud tallboy to my lips without moving my arm and I can really relax. Boy howdy!